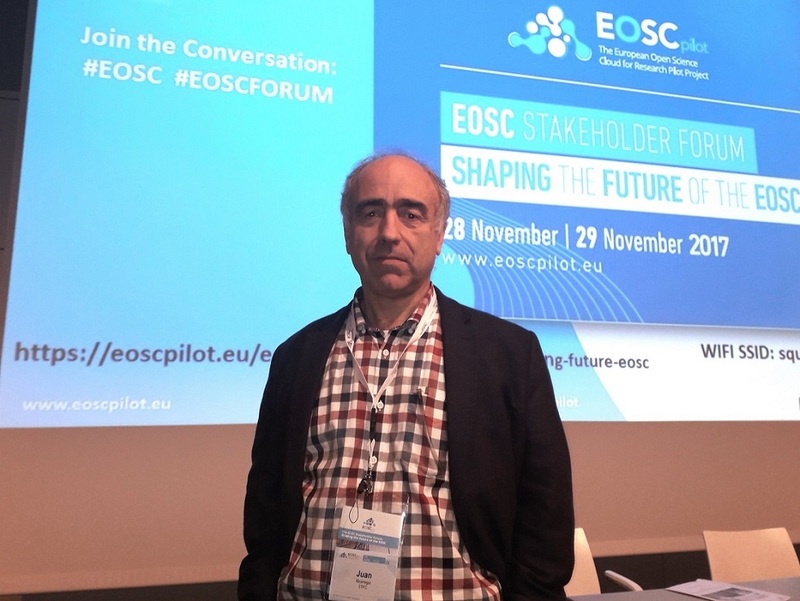 <h2>Establishing a sense of direction is first step for open science cloud – Dr Juan Bicarregui</h2><br /><p><strong>You coordinate the EUR 10 million European open science cloud pilot project, which is laying the groundwork to develop the open science cloud. Could you remind us what the ultimate ambition is for the cloud? </strong></p> <p>‘One of the things Commissioner Moedas (the EU's research, science and innovation commissioner) has said, which I agree with completely, is that this is going to allow a new generation of scholars to share and communicate data and discoveries in a way that has never been done before. The idea is, that everyone can share their information, the computer services, the algorithms, the analysis of the data, in order to make better discoveries. If you read a paper and you see a graph, you will be able to click on the graph and you’ll get the data of what’s behind that graph. You can also read up on the analysis that produced the data. That will push science along a lot more quickly.’</p> <p><strong>You're one year through the two-year pilot project. Can you explain what you’ve achieved so far?</strong></p> <p>‘There were a number of barriers to the science cloud identified last year. A lot of those were about the way that science is done. We needed to remove those barriers&nbsp;by gathering people together across disciplines, across countries and across roles. That’s the first job – bringing everyone together to agree what we need to do.</p> <p> <div class="quote-view quotesBlock quote_horizontal"> <div class="quotesTop"><img src="https://horizon-magazine.eu/sites/all/themes/horizon/images/quotes_top.png" alt="" title="" /></div> <p>‘In theory sharing is good, but in practice it can be difficult to get it right.’</p> <blockquote><p>Dr Juan Bicarregui, Science and Technology Facilities Council, UK</p></blockquote> <div class="quotesBottom"><img src="https://horizon-magazine.eu/sites/all/themes/horizon/images/quotes_bottom.png" alt="" title="" /></div> </div> </p> <p>‘We need to reach a consensus about what we should be focusing on and what the programme should be. That’s the biggest thing that this pilot phase is doing, it's building this sense of direction and the prioritisation of the different and possible activities.’</p> <p><strong>There are several different open science cloud platforms already in Europe. How will you integrate them into the main European open science cloud?</strong></p> <p>‘The underlying principle is that we’re not going to build something new from scratch. We’re putting together the existing infrastructures that each domain has. We’re working with existing disciplinary infrastructures – for example,&nbsp;<a href="https://www.elixir-europe.org/" target="_blank" rel="noopener noreferrer">ELIXIR</a>, which manages biological data, the <a href="https://www.epos-ip.org/" target="_blank" rel="noopener noreferrer">European Plate Observing System</a> which monitors the Earth’s crust and the <a href="http://www.helix-nebula.eu/" target="_blank" rel="noopener noreferrer">Helix Nebula</a> project – to see how we can make them interoperate better.’</p> <p><strong>What are the main challenges that you’ve seen so far? </strong></p> <p>‘In the technical area, it’s about making improvements without breaking what’s there. As I said, the infrastructures in the various domains already work. We have to see what we can do to improve sharing without adding extra complications. We’re not trying to replace&nbsp;them but improve them.</p> <p>‘Part of the challenge is to come to a common understanding of what the potential benefits are. Another area we’re looking at is the rules of engagement. If you want to put your service on this cloud, are there quality thresholds that need to be put in place before you’re allowed to get it online? And where is that bar, so that consumers know what level of quality to expect?’</p> <p><strong>After the pilot project finishes, what are the next steps? </strong></p> <p>‘The pilot is not really building much new technology. It's more like a design study, we're looking at what we are trying to build and how will we build it, rather than actually building it. The pilot runs for two years from last January so we’re halfway through, roughly.</p> <p>‘There are a number of projects starting in the new year. There’ll be the EOSC-hub starting in early January with over 70 partners. It will develop the technological side of the open science cloud.’</p> <p><strong>There’s been a lot of debate and discussion about how the European open science cloud should proceed. What are your thoughts about this? </strong></p> <p>‘There’s a balance that needs to be struck between continuing to develop the domain-specific infrastructure and trying to share infrastructures across domains. That’s what most of the debate has been about – where’s the sweet spot between those two. If we could share infrastructure then we could be more efficient. In theory sharing is good, but in practice it can be difficult to get it right.’</p> <p><a href="http://bit.ly/newsalertsignup" target="_blank" rel="noopener noreferrer"><img class="" src="https://horizon-magazine.eu/sites/default/files/news-alert-final.jpg" alt="" width="983" height="222" /></a></p> <p><strong>When do you think that researchers will be able to start using the cloud?</strong></p> <p>‘Some of it, very soon. Some parts are already being built now. Then the new projects that will start in January 2017, they’ll start delivering new services about a year from then. And we’ll build from there. It’s not a big bang thing, it’s about improving incrementally.’</p> <p><strong>Are you optimistic about the European open science cloud?</strong></p> <p>‘Am I hopeful it will work – yes, of course – I wouldn’t be running this project if not! But I also think it’s a long road. It’s a gradual change, each step helps but we’re (not) going to change everything overnight. I do think it will eventually change how science is done.’</p> <p><em>If you&nbsp;liked this article, please consider sharing it on social media.&nbsp;</em></p> <br /> <img src=”http://www.google-analytics.com/collect?v=1&tid=UA-40077089-1&cid=establishing-a-sense-of-direction-is-first-step-for-open-science-cloud-–-dr-juan-bicarregui&t=event&ec=republish&ea=read&el=establishing-a-sense-of-direction-is-first-step-for-open-science-cloud-–-dr-juan-bicarregui&cs=republish&cm=republish&cn=republish&cm1=1" /> This post <a href="https://horizon-magazine.eu/article/establishing-sense-direction-first-step-open-science-cloud-dr-juan-bicarregui.html">Establishing a sense of direction is first step for open science cloud – Dr Juan Bicarregui</a> was originally published on <a href="https://horizon-magazine.eu/">Horizon: the EU Research &amp; Innovation magazine | European Commission</a>. You coordinate the EUR 10 million European open science cloud pilot project, which is laying the groundwork to develop the open science cloud. Could you remind us what the ultimate ambition is for the cloud? You're one year through the two-year pilot project. Can you explain what you’ve achieved so far? ‘There were a number of barriers to the science cloud identified last year. A lot of those were about the way that science is done. We needed to remove those barriers by gathering people together across disciplines, across countries and across roles. That’s the first job – bringing everyone together to agree what we need to do. There are several different open science cloud platforms already in Europe. How will you integrate them into the main European open science cloud? What are the main challenges that you’ve seen so far? ‘In the technical area, it’s about making improvements without breaking what’s there. As I said, the infrastructures in the various domains already work. We have to see what we can do to improve sharing without adding extra complications. We’re not trying to replace them but improve them. After the pilot project finishes, what are the next steps? ‘The pilot is not really building much new technology. It's more like a design study, we're looking at what we are trying to build and how will we build it, rather than actually building it. The pilot runs for two years from last January so we’re halfway through, roughly. There’s been a lot of debate and discussion about how the European open science cloud should proceed. What are your thoughts about this? When do you think that researchers will be able to start using the cloud? Are you optimistic about the European open science cloud?